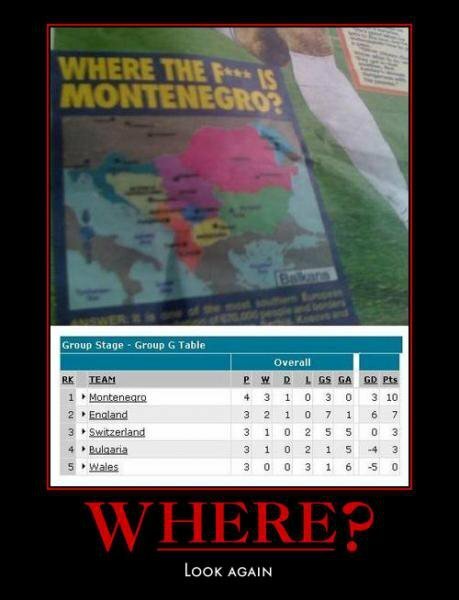 Viral Football: Where The F**k Is Montenegro? Btw Montenegro played this game without their two very best players, Mirko Vucinic and Stevan Jovetic, so I expect that they will win second game with England if these two awesome players could play that game! Now you will know where the F*** is Montenegro you ignorant B*******!!! So you don’t know where is Montenegro?? WE ON THE FIRST PLACE!! !